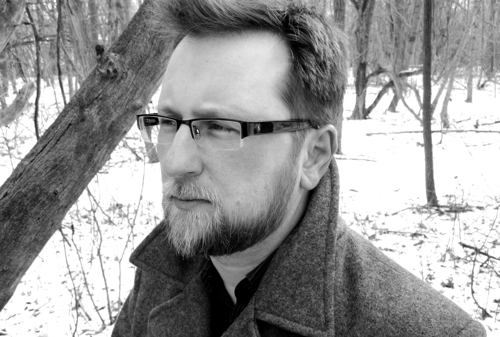 Simon Strantzas is the author of four short story collections, including the upcoming Burnt Black Suns from Hippocampus Press. His fiction has appeared in The Mammoth Book of Best New Horror, and The Year’s Best Dark Fantasy & Horror, and has been nominated for the British Fantasy Award. He resides in Toronto, Canada. C. Derick Varn: What do you make of what appears to be Weird Fiction revival in the last three to four years? Do you agree that it is a revival? Simon Strantzas: Revivals. Waves. Ages. These things are, as they say, notoriously difficult to call while they are happening, and probably only discernable in hindsight. I think it’s true to say that in the last few years a style of fiction more grounded in the classically weird seems to have a louder voice than in the past, but I’m not certain it’s anything beyond a coincidence, or perhaps a small group of talented writers inspiring one another. These revivals, when plotted over time, are a sinusoid, and it’s likely just the classically weird’s time at the crest. What’s unfortunate is that even the best of this new breed aren’t able to make a full-time living as a writer. But that’s nothing new. Not since the boom of the 80’s and 90’s have horror writers been able to live off their work. But, I suppose, many of those writers were established in other fields as well, and took to horror because it was paying well. That might explain why the majority left for sunnier climes when the bubble burst. One of the nice things one can say about the current crop is that they write horror and weird fiction out of a deep love for the genre. If we presume, though, there is indeed a revival happening, something unique from those writers working before, then I must admit we live in some exciting times, because there are certainly a large number of writers whose memory not only seems to extend beyond the last thirty years, but also has learn lessons from other genres, and other cultures. What I find most exciting is that it seems these writers are *different* from one another as well, each offering the reader a unique experience. There are many nuanced reasons why this sudden confluence of weird writers may have taken place, but to my mind the primary one is the rise of technology. Before the internet, weird fiction may not have been viable because it’s not terribly commercial. If horror thrives in the shadows, then the classically weird occupies their darkest umbra; in many ways, it’s an acquired taste. Before the internet, finding sympathetic readers could prove difficult, so a critical mass was difficult to reach. With the appearance of message boards and social media, those readers could discuss and recommend books and authors, and what once seemed like a solitary fascination became something communal. I recall my own early days discovering the breadth of ghost fiction due to these forums, and I gained an education I likely never would have a few years earlier. These boards were also where I discovered the small press movement, where technology too has played a key role. Books no longer had to sell in high numbers to become profitable, and thus less commercial books found a home, especially books reprinting past masters for those small circles of readers. Sudden authors were available again to a new generation of readers, a generation who, like me, had grown bored of what was on the major retailer shelves. I was able to read Aickman this way, and Smith, and Chambers, and Benson, Burrage, and Marsh. Metcalfe and de la Mare. I like to believe other gestating writers were inspired similarly, and grew in a way those that proceed them by only a few years couldn’t have. I don’t think it’s a coincidence many writers of this suggested revival are only a few years in age from one another. Do you see the rise of internet publishing and the decline of “traditional” print media returning us to something like the pre-war pulp years? I don’t imagine there’s anything that will return us to the pre-war pulp years. That was a golden age, where books could be mass produced, leisure time was increasing, and yet there was little else to distract people from reading. Now that computer technology is upon us, we have far too many things to occupy our time, and frankly it’s much easier to stare at a small screen on a train ride and while away time than it is to read a book. And there’s also a quiet pressure on people to read less for fear they will appear to be snobbish and not-of-the-people. But internet publishing has brought us a lot, as I’ve mentioned, and that ease of access is definitely an advantage. Though I wouldn’t go so far as to say we can return to the pre-war years, what we have can be better in some ways. Reproducing work in ebooks means there will be fewer barriers to prevent people from reading what they like. Text will become most important, and it may no longer matter how old a book is or how small the publisher was — you will have acesss to it from anywhere in the world. The only barriers are of language and literacy. This is of course an ideal, and who know how long it will take to get there, but I don’t doubt we will. One day, all the world’s texts will be digitized and accessible. But how this will affect us as readers is still a great unknown. The irony is that the better technology gets, the further it leaves readers behind. What I do think is that, as time continues, the traditional New York publishers will focus more and more on vaccuous books, those common-denominator books, and the more experimental, bizzare, and literate books will be taken on by smaller and smaller presses. The ebook phenomenon is a great equalizer — those small press ebooks don’t look or cost that much different from those published by the bigger companies, and they can scale just as well, so it seems likely the smaller outfits will simply take over that role from the traditional publishers. That return to a heterogeneous publishing landscape would hopefully bring with it a more diverse set of literary possibilities. What are the trends that you see that make you particularly hopeful about the current literary scene? The only trends I see are writers who are trying to recontextualize what’s come before, and better integrate the lessons learned from outside the genre within it. John Langan, for instance, works in a form of postmodernism, twisting the knowledge of the genre his readers already have back on the genre itself. Laird Barron strives to make his collections not simply a group of stories, but a whole that is greater than its sum. Stories echo one another, places and people repeat, and though its been chalked up to mythos building I think of it as something more — as treating the collection like a concept album. And these are only two examples. I could list many more. The point is that we are seeing new experimentation in the weird horror genre, which in many ways is exactly what the term “weird” is about — these writers are not content in repetiton and regurgitation; they want to bring to the table something only they can bring. I think we’re going to see this attitude inspire the generations of writers coming up, just as soon as they figure out how to internalize what their heroes are doing and make it their own. I’m also pleased to see a greater presence of weird horror from outside the western world. We’re seeing it appear from India, from Sweden, and Japan… places that have their own traditions to build upon, that in turn bring new directions to the table. As globalization increases, and the ubiquitousness of the internet brings more and more disparate cultures together, we’ll continue to seeing invigoration in the genre, which can only lead to great things in the future. Do you see this as undoing some of “Weird Fictions” W.A.S.P and sometimes even xenophobic tendencies in the early 20th century? No, not at all. I don’t think the western slant to Weird fiction will ever disappear. The genre’s foundations come from it. All we can hope is that these other multi-cultural influences will expose different facets of the weird and expose new paths for those who write it. The worst thing that could happen is the genre feeding on itself, making copies of copies. It’s true there is some unfortunate xenophobia is the genre’s history, but that’s hardly unique to this kind of writing, and I think it’s more important to do better going forward than try to apologies for what was done in the past. Do you see similar movement in related genres? My authority wavers the further from horror and weird we travel, but it seems to me that many of the basic tenets of weird fiction, as we generally recognize them, are founded in the history of the Western world, which lends a colonial attitude to the stories. Because of this, it’s the sort of genre that is least open to the sort of fundamental changes the introduction of World fiction can provide. I think by their nature other genres like Science Fiction are more open to this sort of plasticity, both in manner of style and story content, so we see many of the speculative genres capable of steps that horror/weird has in the past been unwilling or unable to take… Or at least do so without transforming into something no longer traditionally recognizable.But I certain hope it’s the case that all the genres are experiencing a similar movement, and though as I have admitted I’m not fluent enough in the other genres to speak with certainty, it seems abundantly true that we have already seen the influence of non-Western cultures in other mediums such as film and music; it seems naive to believe the same isn’t happening in our fiction as well. As global culture becomes more and more homogenous, the shared experience and tools that fiction uses will likely become more and more ubiquitous. How do you see the internet specifically helping your work? The internet has helped in immeasurable ways. The first, of course, is the ease it brings to research. Certainly, encyclopaedias existed in the past, but with the internet that sort of information can be augmented with actual conversations with people from different countries, or with different skills and knowledge. Any information one might want can be found and verified by a literal world of experts. A number of my tales would not have been written without these sources. There is also the added access to readers through email and social media. The latter, especially, has allowed authors to make great in-roads in self-promotion, and provided an unheralded communication conduit with readers across the globe. The Weird genre is so specific an interest that were it not for the internet, most of its fans would likely live in ignorance of one another. Without it, there wouldn’t be the community of weird fiction aficionados there is now. It’s by their interaction and continued recommendations that make fiction sells. It’s true some aspects of the author/reader relationship have been lost by this interactive age, but the benefits seem to balance them out. I certainly wouldn’t have developed the same relationship with other authors without it, and it’s those relationships that often provide the support needed when the road gets rocky. Would you like to talk about any work of yours that is coming out in the near future? In early 2014, my fourth collection of fiction, BURNT BLACK SUNS, will be released by Hippocampus Press. I was eager to work with Hippocampus after reviewing their line-up of contemporary authors and realizing it was a veritable Who’s Who of the most gifted weird writers working today. To be in the company of folks such as Langan, Pulver, Pugmire, Cardin, and Gavin is quite an honor. This new collection started life as a sort-of sequel to my first, BENEATH THE SURFACE, in the sense that the tales all explore a similar mode of horror fiction—in this case, the traditionally weird—but over time the book has transformed into something unexpected. The book is the longest I’ve written to date; the reason for this being the inclusion of two significant novellas of cosmic terror. I enjoy this length for the opportunities it provides in offering a more complete character studies. That said, the book does have some shorter pieces as well. All in all I think this is the strongest collection of stories I’ve written, and hope readers find a lot to enjoy with its pages. Other than the new collection, I have stories lined up for the next two Black Wings volumes, and Searchers After Horror all edited by S. T. Joshi; and an upcoming issue of Postscripts magazine. Additionally, I’ll be sharing space with some luminaries for essays and tales in Aickman: A Centenary Edited by Johnny Mains. Any other projects on the horizon are far too nebulous at the moment to mention. I just wanted to reiterate that these are truly exciting times to be a reader. In the past year or so alone we have seen a steady release of what I consider landmark books in the genre, and as time progresses I think the number of books of this calibre will grow. Perhaps this generation is different from that during the “boom” because the idea of writing in the genre has been to some degree legitimized, yet the glossy-eyed belief that there is money to be made doing so is gone. What we have instead is a group of writers wanting simply to do the best, most interesting work they can. Should this continue, I hestitate to imagine where the genre might end up. For these reasons and more, I’m truly optimistic and excited about the future of weird horror.